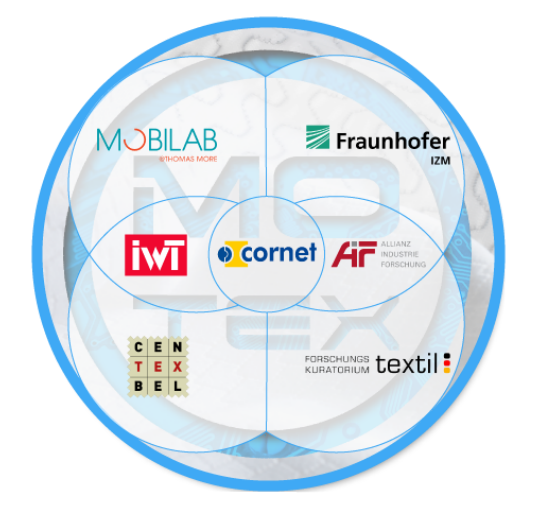 To achieve the MOTEX goals, an international highly motivated complementary project consortium of four key partners is formed through the international CORNET funding channel. Centexbel (B) will contribute to this project by sharing their knowledge on how to sucessfully integrate sensors into wearable or intelligent textiles. Fraunhofer IZM Systems On Flex (D) will use their developed key competenties in the field of stretchable circuit boards to miniaturize and integrate flexible sensor electronics into the intelligent textile. The Forschungs Kuratorium Textil, FKT, is the umbrella organisation for collective research activities in the field of fibre based materials. They will use their established network to distribute and integrate the findings of this project. Both Regions are funded by their own funding organisation as depicted by cornet regulations. For Flanders (BE) this is IWT and for Germany this is AiF.